If you watch American popular culture and media, it is easy to come away with a rather depressing story about the lives and experiences of black men. News media tend to overrepresent black men as criminal, and movies like Paid in Full, State Property, and Get Rich or Die Trying do their part to portray black men as victims and/or survivors of an urban ghetto defined by violence, poverty, neglect, and drug use. At the other end of the spectrum, extremely visible, successful black men like Bill Cosby and Barack Obama suggest hard work, staying in school, and good behavior are surefire routes to success. Both accounts offer a very two-dimensional picture of black men’s lives in the U.S. today. They give the impression that nearly all black men are facing the dire threats of un- or underemployment, failing schools, urban neglect, and jail time. Those who do not fit this categorization may seem to be on another end of a continuum—part of an extremely well off, highly visible minority who point to their own accomplishments as proof that properly channeled ambition leads to success. The story media and current research tell is usually that black men’s lives generally exist only on these two ends of a spectrum. In my book No More Invisible Man: Race and Gender in Men’s Work, I try to draw attention to black men who do not fit either of these categorizations—everyday professional, middle class black men who work in white-collar jobs. These men are generally invisible in media and even in a great deal of sociological research, which tends to devote more attention to working class or poor black men in urban areas. But for black professional men, their lives don’t necessarily reflect those of their working class peers. Nor do they share the same workplace experiences and concerns as black professional women. Instead, race, gender, and class create unique work conditions for black professional men that are very different from those of other groups. Theoretically, we might expect the concept of tokenism to explain black men’s work experiences. This theory suggests that being in the minority leads to differential, usually negative, treatment. Among other things, it makes people stand out from the majority and makes it harder to fit in to the larger group. I found, however, that this theory did not always explain the particulars of how black professional men encountered different aspects of their work environments. As a corrective, I introduce the theory of partial tokenization, which provides a better blueprint for understanding how race, gender, and class shaped their work in selected fields. By partial tokenization, I argue that these intersecting factors coupled with work in a culturally masculine occupation shape these men’s experiences in the minority. 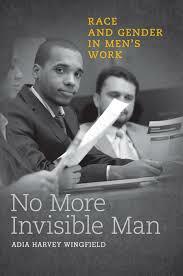 The book explores this thesis through several different dynamics of these men’s work lives. I focus on their general experiences in the workplace, interactions with women, relationships with men, demonstrations of masculinity, and emotional performance. Overall, my study shows how race, gender, and class create unique conditions at work for black men in professional jobs. Cross posted at the Gender & Society blog.